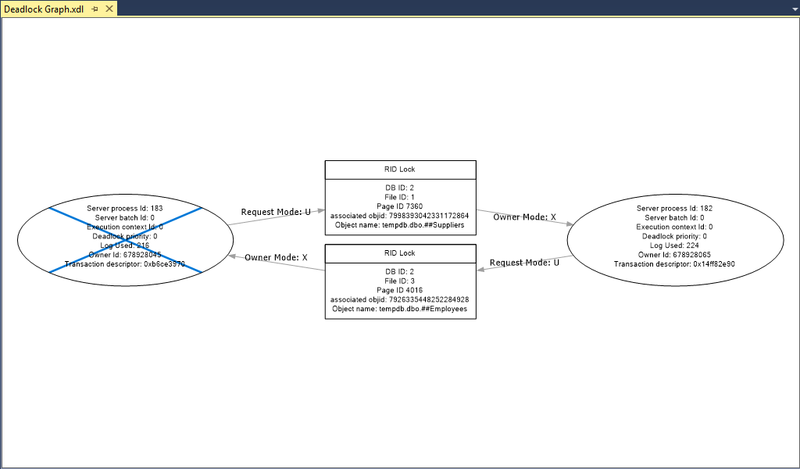 I've seen a few different methods for handling deadlocks in SQL Server. I don't notice the use of event notifications very often, so I thought I'd share my approach. For my purposes, I want SQL to notify me when a deadlock occurs. I also want an easily accessible deadlock graph that I can inspect and potentially pass along to development or software vendors. Let's skip ahead to the end result. Here's a glimpse at my Outlook Inbox. The selected email is an alert I received when a deadlock occurred. An EVENT NOTIFICATION for the DEADLOCK_GRAPH event. An activation PROCEDURE for the QUEUE. --Create a queue just for Deadlock events. --Create a service just for Deadlock events. 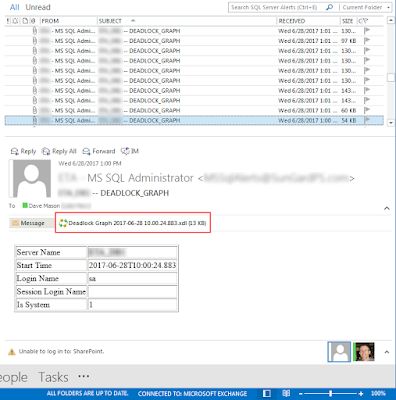 -- Create the event notification for Deadlock events on the service. on the queue AND the response wouldn't be sent. The <deadlock-list> element and all of its data is assigned to the @Qry variable. This data will become the contents of a file attachment for an email message. Next, we create a "query" that does nothing more than select the <deadlock-list> data as a string literal. This "query" will be the @query parameter value for msdb.dbo.sp_send_dbmail. The REPLACE function is used to double up any single quotes that may exist. As noted, there are other ways to handle deadlocks in SQL Server. The approach presented here may have some drawbacks compared to others. 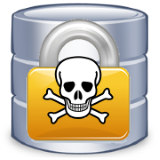 There is an authorization issue for msdb.dbo.sp_send_dbmail that will need to be addressed for logins without elevated permissions. Additionally, you might get hit with an unexpected deluge of emails. (The first time I got deadlock alerts, there were more than 500 of them waiting for me in my Inbox.) Lastly, there's the XML issue: it's not everyone's cup of tea. On the plus side, I really like the proactive nature: an event occurs, I get an email. I think most would agree it's better to know something (bad) happened before the customers start calling. 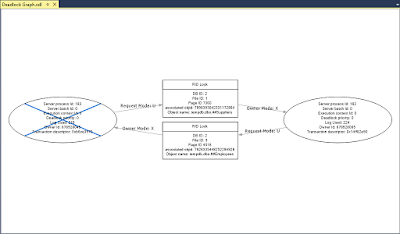 The automated generation of Deadlock Graph (*.xdl) files is convenient. And event notifications have been available since SQL Server 2005. As far as I know, the feature is available in all editions, including Express Edition. Hi. 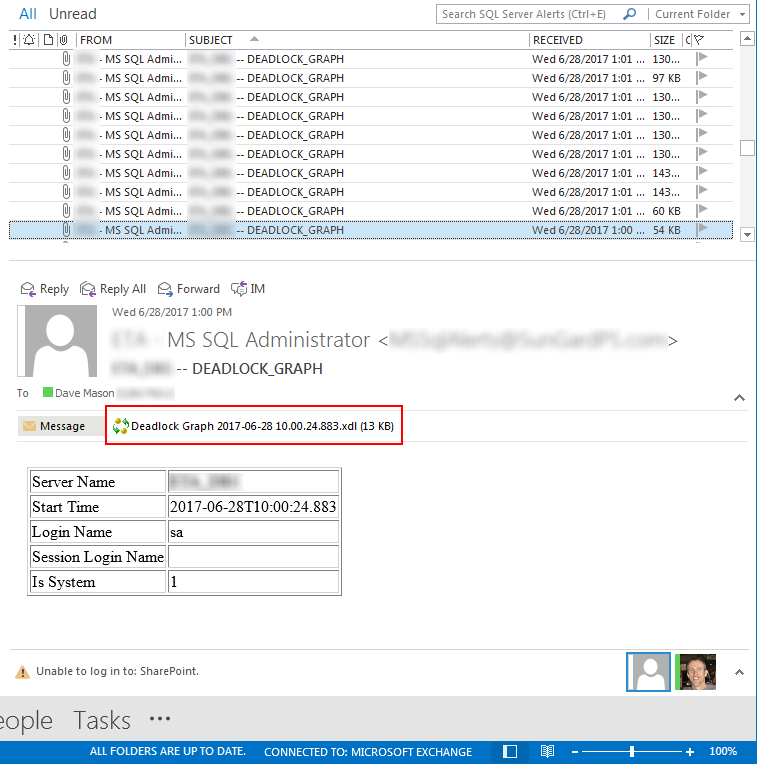 When I open the emailed DeadlockGraph in SSMS and hover over the ovals, the SQL statements don't appear. A tooltip with the word Statement: appears but nothing else. Any ideas?